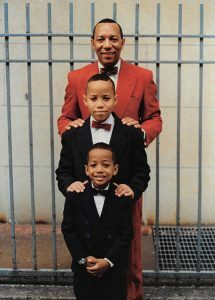 The Gordon Parks Foundation today announced a solo exhibition of the work of documentary photographer Jamel Shabazz to be presented this spring at The Gordon Parks Foundation. Jamel Shabazz: Honor and Dignity will be installed at the Foundation’s exhibition space from April 5 through July 12, 2019 and is free and open to the public. The public artist reception is on Friday, April 5 from 6 to 8PM where the artist will provide a soundtrack of music that has inspired him and will also be available to sign books. On view during the opening of Honor and Dignity will be a group of Gordon Parks photographs selected by Shabazz. For more information about The Gordon Parks Foundation, its programing, and its Awards Dinner and Auction, please visit gordonparksfoundation.org and follow on Facebook and Instagram.